If there's one thing youngest Gorgebag is not short on it's confidence and quite rightly so, even if a Momma's opinion is a little biased. Recently though he's been plagued with breakouts as is a teenage skins wont and it's getting him down a little. 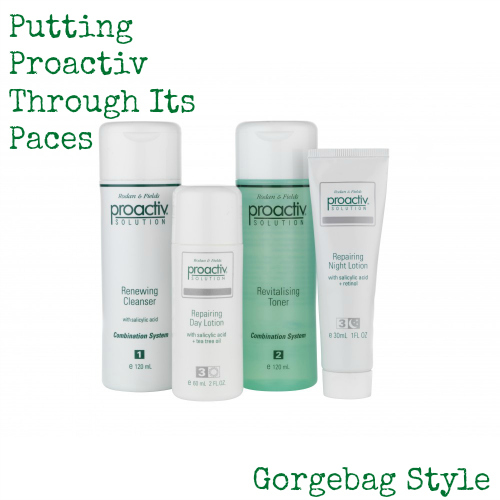 In three steps, that we're hoping, might be a solution, the Proactiv Anti Blemish skincare system is going to give it its best shot to help us out. You might recognise Proactiv from such famous face parts as Jessica Simpson's T Zone, Katy Perry's smig and Justin Bieber's smug cheeks, the list of celebrities that have lined up to endorse this product goes on and on and yep, that's great but when Lorraine over at Beauty Features told me that's it's one of their best selling skincare products with the highest rate of repeat purchases then I knew we'd have to try it. The Proactiv range, using the active ingredient Salicylic Acid, works in 3 steps to clear blemishes and prevent future breakouts. Renew: The oil free cleanser contains tiny microbeads to gently exfoliate. This is to be applied morning and evening to dampened skin. Revitalise: The revitalising toner helps lift any remaining residue on the skin and assists in closing the pores, making skin appear calmer. Repair: There are two lotions on the 4 Piece Set, one specifically for day time and one for night. Both contain Vitamin D, E and Retinol to even skin tone and help to reduce further breakouts on the skin. We've included 'Before' photos here because over the next four weeks we're going to put Proactiv's claims to the test and use these photos side by side to judge progress. Check in next Toosdy to see how we're doing one week on. The Proactiv Anti Blemish skincare system is available on BeautyFeatures.ie right now should you wish to join us in this trial, I can't guarantee you'll look as devilishly handsome as teenage Rico Suave up there but we have high hopes for a clear kissers all round in a matter of weeks. 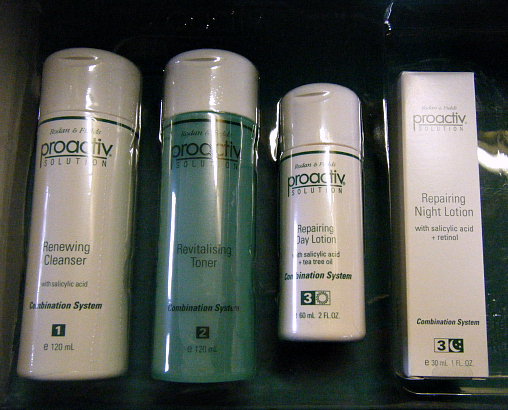 Have you tried Proactiv already? I'd love to know what kind of results you've had. Eh, I too am happy to find your distinguished way of writing the post ;) but mostly I just wanted to say OMGADORBS! Really looking forward to seeing how this works for him. I'm nathin' if not distinguished Lynnie :) Plagued with those bastid bots of late! refining mask(clay mask) the best and uses it still once a week. She hasn't had a spot in over a year and a half with this regime. So best of luck. Just in case your your kitchen's needs significant bar hole, less complicated it might be thrilled to order a rather huge proportioned toaster oven with your case. Them plane advancement incessantly styles heat a lot more your meals, roasting from convection. Sunbeam ran a toaster that if unquestionably the breads has been incorporated it also tripped a great lever to modify within heater.